The first NASA crew to ride to the International Space Station on a commercial spacecraft may have to wait until at least the end of 2017, after NASA’s planning group realigned the US Crew Vehicle -1 (USCV-1) mission to a launch date of November 30, 2017. 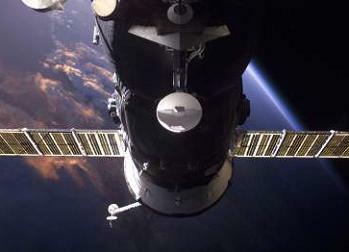 The new schedule includes the Russian Soyuz manifested as a back-up option, through to at least 2019. NASA’s Commercial Crew Program is currently funding three private companies to build transportation systems that can remove NASA’s reliance on the Russian Soyuz to ferry American astronauts to the International Space Station (ISS). This process is currently in the Commercial Crew integrated Capability (CCiCAP) stage, maturing from the Commercial Crew Development (CCDev) drive that resulted in three companies earning NASA money to develop their spacecraft to be able to carry NASA astronauts. It is likely that only one of the contenders will be selected to win the long-term NASA contract to carry out the role of ferrying NASA crews to the ISS. The current favorite is understood to be SpaceX, who have already conducted three successful missions to the ISS with the cargo version of their Dragon spacecraft, launched via the company’s Falcon 9. However, they are by no means runaway favorites, with Boeing’s CST-100 already setting up base at the Kennedy Space Center (KSC), and Sierra Nevada Corporation’s Dream Chaser spaceplane offering NASA “dissimilar redundancy” as the only option that isn’t a capsule. 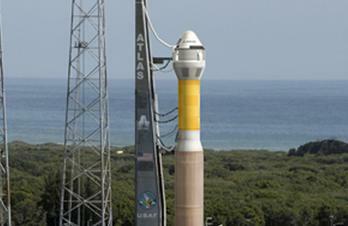 Both CST-100 and Dream Chaser will also use the hugely reliable Atlas V as their launch vehicle of choice. 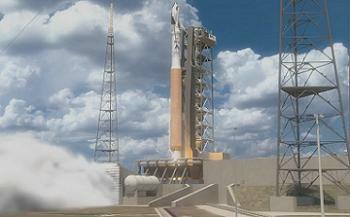 Friday’s update noted they had successfully completed a Preliminary Design Review (PDR) on the Launch Vehicle Adapter (LVA) – the component that will be used to connect the CST-100 to the Atlas V’s Centuar Upper Stage. The review is one of six performance milestones Boeing has completed for the CCiCap initiative, a process that totals 19 milestones under NASA’s $460m award. The company also completed the recently completed the Engineering Release (ER) 2.0 software review and the Landing and Recovery Ground Systems and Ground Communications design review. All three CCiCAP companies have confirmed they are targeting a crewed test of their spacecraft sometime in the 2016 time frame – with SpaceX hinting they may be ready by 2015. Notably, the crews will be selected internally, from within the company roster, as opposed to using NASA astronauts. Should the test missions prove to be successful, a winning company will be selected by NASA to conduct the first crewed mission to the International Space Station – a mission known as US Crew Vehicle -1 (USCV-1). As of November of last year, the launch date for USCV-1 was November 30, 2016 – per the Flight Planning Integration Panel (FPIP) presentation (L2), resulting in a docking to the Node 2 Forward port – via the use of an ISS Docking Adapter (IDA) attached to PMA-2 – on December 2, 2016. 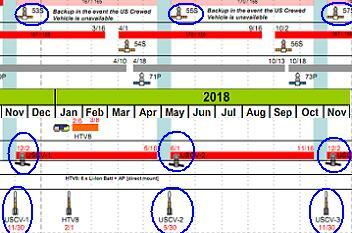 However, the March update for the FPIP presentation (L2) shows a full one year slip to the USCV-1 mission, with a launch date penciled in for November 30, 2017, followed by a docking on December 2, 2017. The USCV-2 through to USCV-6 are shown to launch at intervals of six months, with a Russian Soyuz penciled in to provide a back up role “in the event the US Crewed Vehicle is unavailable” through to the USCV-4 mission in 2019. The slip is not official and the FPIP presentation is a planning document, meaning its information is preliminary. However, like its Shuttle equivalent – the Flight Assignment Working Group (FAWG) documents (L2) – changes to the schedule always begin at this stage of planning, and almost always become the reality. As to the reason for the slip, sources point to the squeeze on long-term funding projections as the major schedule driver. Also, according to Russian media, NASA began negotiations with Roscosmos in February, with a view to extending their deal to purchase seats on the Russian Soyuz by another year, taking the arrangement into the middle of 2017. 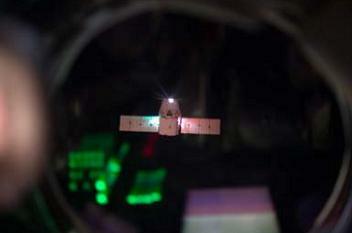 A confirmed delay to the USCV flights will impact the ISS in several ways, not least because the USCV missions will carry four crewmembers, meaning that once they dock to the ISS, the crew of the station will be boosted to seven – allowing significant extra research activities to be performed. Notably, one of the crewmembers on the USCV will be Russian – just as one American crewmember will continue to be rotated on the Soyuz. This is done in order to ensure that a US crewmember is always present on the ISS, even when no USCV is docked to the station. It is not known at this point whether the seat on the USCV will be provided to Russia in exchange for a US seat on the Soyuz.